May 12 to 26, 2019. Tickets $15/ $20. Call 905-543-8512. Artword Theatre presents Whoever You Are, a play written and directed by Ronald Weihs, based on a 1952 science fiction short story by Judith Merril. The human race has built a web around the Solar System that traps alien life forms. A SolSys scout ship returns with aliens aboard and is caught in the web. When a young recruit boards the ship and investigates, it becomes evident that the aliens have what may be an irresistible weapon: they love everybody. Do we dare let them in? On Phobos (one of the moons of Mars), three people must decide what action to take: two men, a military commander and a psychologist, and one woman, the public information officer. Performed by Jordan Campbell, Paula Grove and Jay Shand as the team at Phobos Base, and Pamela Gardner as Private Fromm, the new space recruit. Recorded participation by Jon-Gordon Odegaard as the seasoned sergeant. Live soundscape by Dave Gould. Video effects by Ronald Weihs and Judith Sandiford. Written in 1952, Whoever You Are was Judith Merril’s answer to the “Fortress America” paranoia at the beginning of the cold war, and her protest against the emotional and sexual repression that fueled it. Although the lines today are less sharply drawn, fear of the alien is as prevalent today as it was then. Like most of Judith Merril’s work, Whoever You Are has fun with the science fiction setting, but uses it to make some serious points. Merril had a major influence on science fiction as one of the main voices for more human themes and complex issues. In her own fiction, and in a series of key anthologies, she championed the position that Science Fiction was about exploring alternative realities. 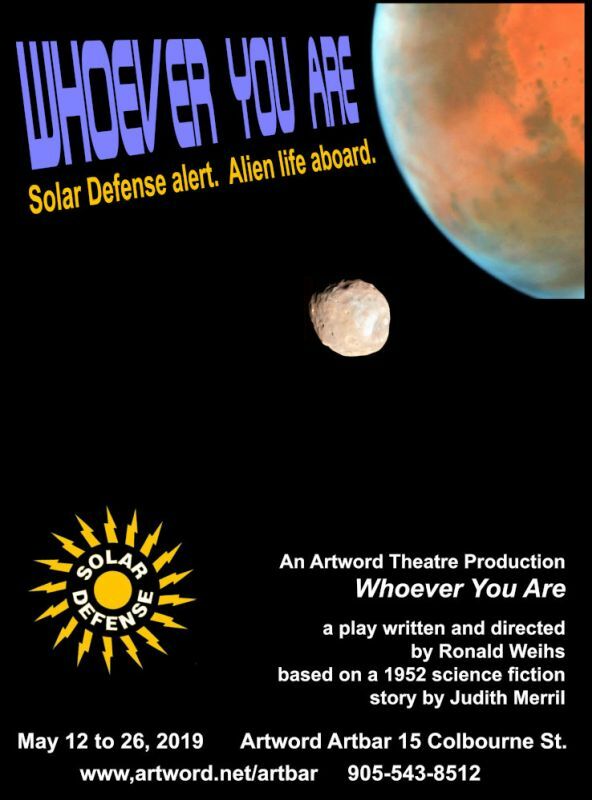 The play by Ronald Weihs was first developed in 1997, when Ron asked her permission to adapt one of her short stories for the stage. Judith Merril died on September 12, 1997, when the project to put Whoever You Are on the stage was well underway. Just before she went to the hospital, she read a draft of the script. Her most significant comment was that the play must convey the sense of inward-looking paranoia, fear and sexual repressiveness that underlies nationalism and xenophobia. It seems even more urgent to revisit these themes now, in 2019, 22 years after our first presentation of the play (in our first Artword Theatre on Portland Street), and 67 years after Judith Merril wrote the original story. Saturday May 25, 2019, at 8:00 pm, $20 door, $15 advance, $10 students. Call 905-543-8512. 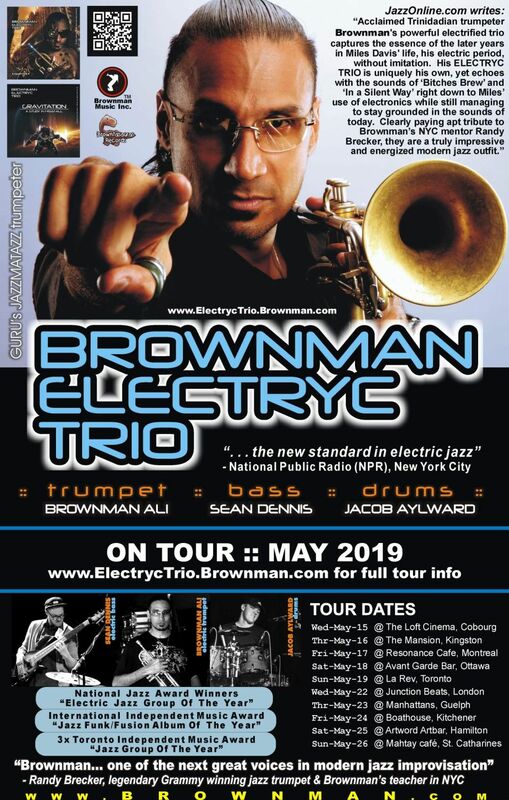 The amazing jazz trumpeter Brownman Ali returns to Artword Artbar with his Electryc Trio on their May tour. 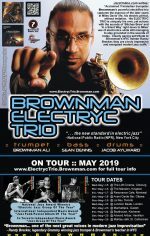 The trio, Brownman Ali on electric trumpet, Sean Dennis on 6-string electric bass, and Jacob Aylward on drums, explore the later compositions of Miles Davis. Monday May 20, Tuesday May 21, Wed May 22, 2019, from 5 to 7 pm. 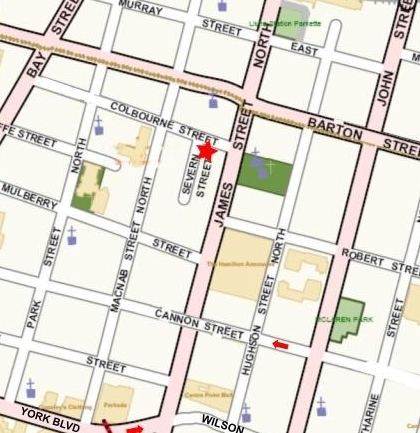 Pint of Science: Hamilton comes to Artword Artbar. Pint of Science is an international festival over 3 days in May. The idea is to bring some of the most brilliant scientists to your local pub to discuss their latest research and findings with you. You don’t need any prior knowledge. It’s a chance to meet the people responsible for the future of science (and have a pint with them). 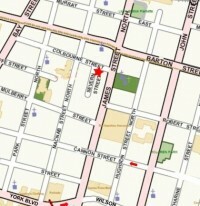 https://pintofscience.ca/team/Hamilton%20Team. 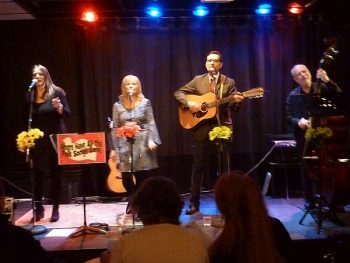 Where Have All The Folk Songs Gone (Spring 2019 edition) returns with a two-show Saturday. We had to turn people away last time, so Sue, Michelle, Dwight and Tony have added a second show. Friday May 10, 2019 at 8:00 pm, $10. 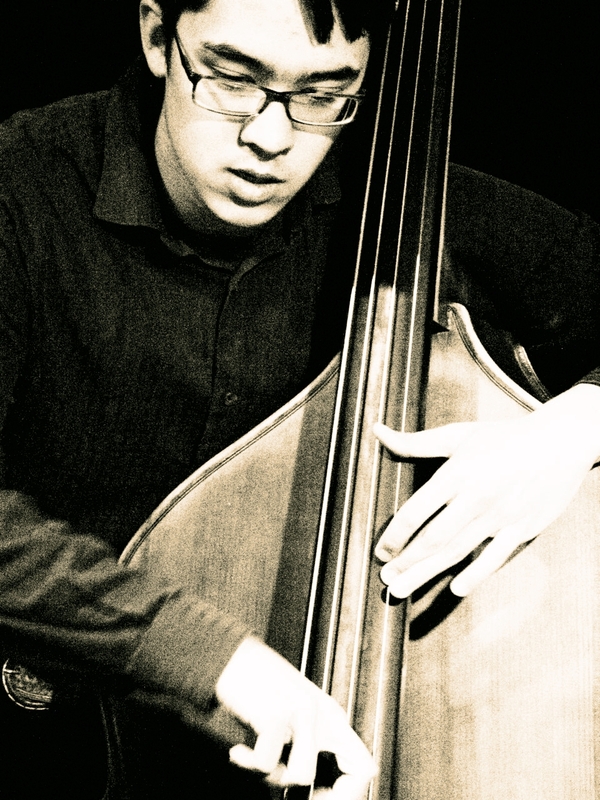 Jazz with the Nick Arseneau Sextet: Nick Arseneau compositions and upright & electric bass, Marie Goudy trumpet, John Nicholson tenor sax, Patrick O’Reilly guitar and effects, Josh Smiley piano, and Harry Vetro drums. Thursday May 9, 2019, at 8 pm, $12 advanced, $15 at the door. Call 905-543-8512. 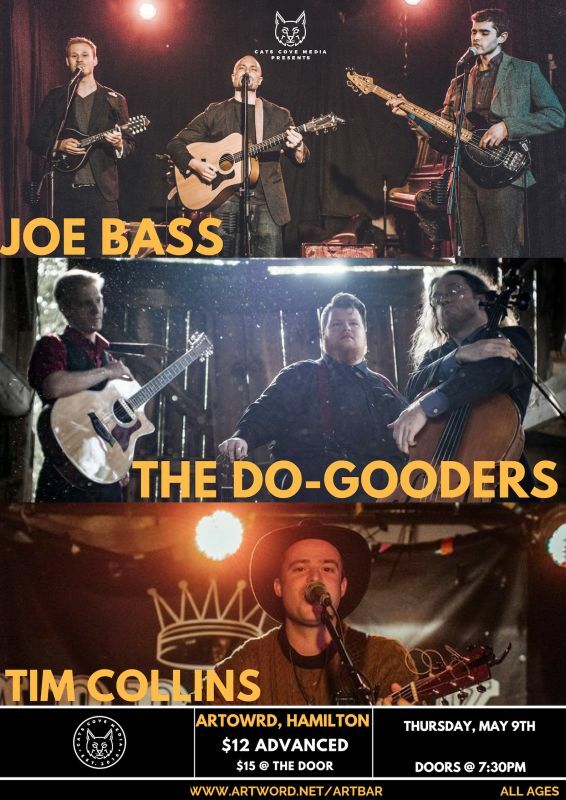 Cats Cove Media presents an artist showcase featuring Joe Bass, The Do-Gooders and Tim Collins. Tim Collins: singer-songwriter in the folk and folk-rock genre. The Do-Gooders: a hard-acoustic trio made up of Hamilton cellist Geoff Ball, and Burlington guitarists Stu Gritter and Dan Murray. Possessing a penchant for storytelling, they tend to snag bits and pieces from different genres in order to find what best suits their whimsically grim (Grimsical?) tales. 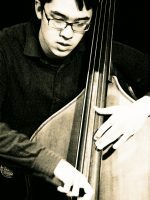 Joe Bass is a guitar, mandolin and bass banjo trio: Sandy James, Eric Marcotte, and Garrett Stratford. Modern folk tales, rootsy genre-bending anthems, and just a dash of small-town nostalgia, Joe Bass offers an adventurous spin on alternative-folk music. Friday May 3, 2019 at 8 pm, $10. 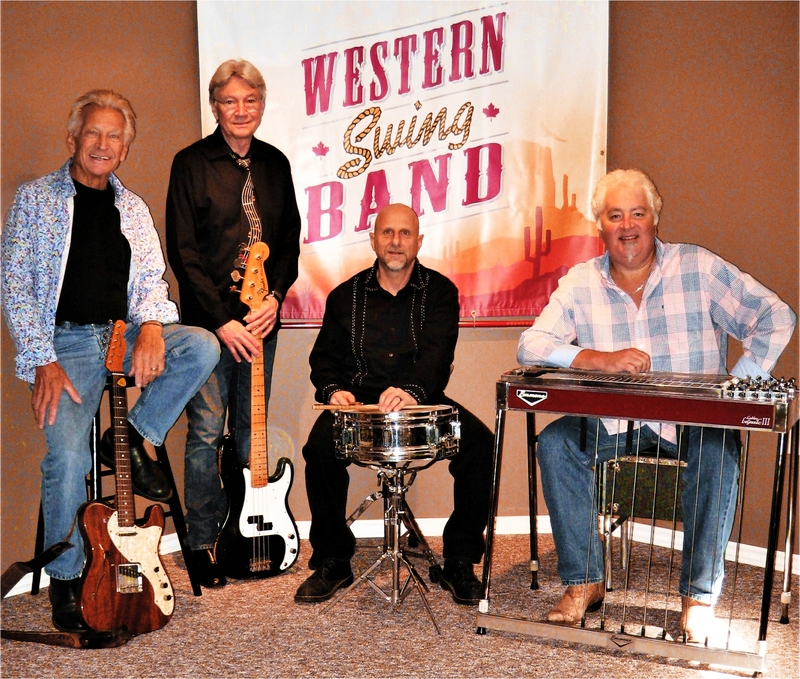 The Western Swing Band with Sonny Sinclair guitar/ vocals; Peter Arthur bass / vocals; Doug Johnson pedal steel, Domenic Di Nino drums. 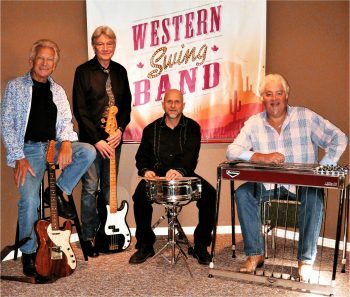 Inspired by the country swing style of Bob Wills and the Texas Playboys, George Strait, The Time Jumpers and Asleep at the Wheel, this band celebrates that great tradition. From country two-step, western swing and Texas waltzes, with sweet vocal harmonies, it’s a bit like travelling back in time to the original days of western swing. DAVID ESSIG was introduced to Canadian audiences in 1971 as a “talented newcomer” at the legendary Mariposa Folk Festival. Now, nearly 50 years later, he continues to pursue an international career as one of Canada’s finest roots music performers. 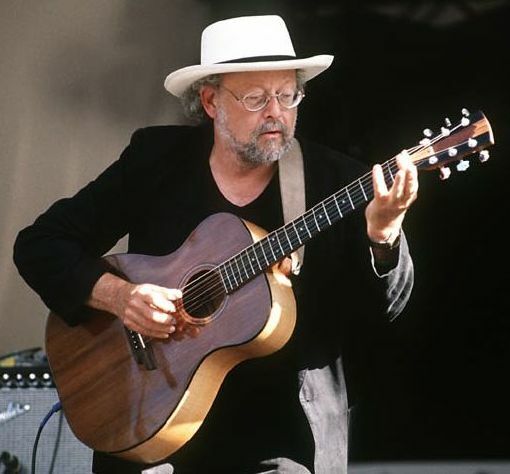 He has appeared at every major folk festival in Canada and at concerts throughout the world. 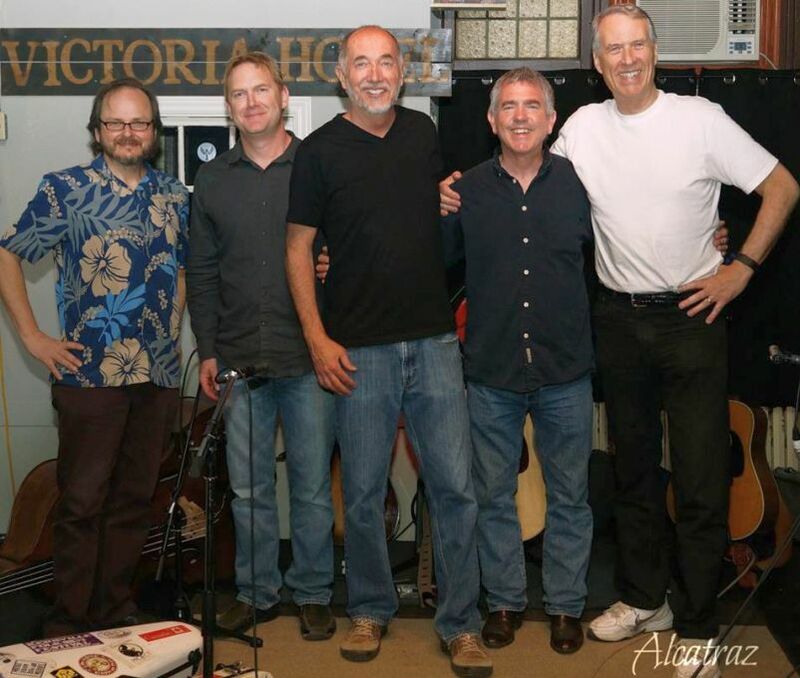 David uses the traditions he grew up with – Bluegrass and Delta Blues – to create timeless original songs. He has released 25 albums and continues to tour across Canada and in Europe, where he has a strong following, especially in Italy. David is a compelling live performer with contemporary original songs that always pay tribute to their roots in traditional country music and Delta blues. Many of his songs, like “Albert’s Cove” and “High Ground,” are considered classics of Canadian roots music. As a producer, David has done over 60 albums with other artists, including the first three albums by both Willie P Bennett and Fred Eaglesmith.